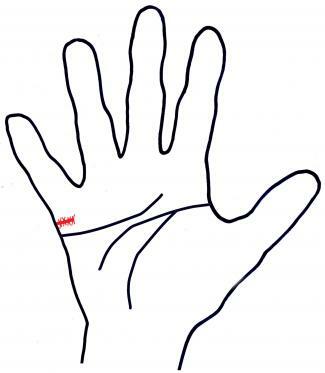 In palm reading, marriage lines are said to reveal many details of an individual's romantic life. They indicate everything from the number of marriages to the number of children born from said marriages. This may seem like a strange leap of faith for some, but palm reading has been around for centuries. Even the early Greeks were known to dabble in a little "chiromancy" (the technical term for palmistry). The lines of marriage are found on the sides of the hand under the little finger. Turn the part of the hand on which you rest while writing to the light and you will see some (it may be one, two or three) deeply cut lines in the hand running horizontally beneath the little finger. These are the Lines of Marriage. Only clearly marked lines relate to marriage. Short lines indicate a serious love affair or marriage contemplated but never entered into. If a line is short and splits at the end, it indicated the person has been engaged, but engagement came to an end. A long straight line shows a person's married life will be filled with happiness. If this line is longest and two or three lines, you can consider that one or two serious love affairs have occurred before marriage. If one or more marriage lines are broken, it indicates the marriage ended badly. If a marriage line has small lines crisscrossing on it, it can indicate continuous problems after marriage. If you see something that concerns you about your marriage lines, remember you're an amateur. A professional palm reader will look at many other lines including the heart line, the destiny line, and the mount of Venus. They will weigh every factor and synthesize their finding to get the full picture. It's also important to know the minor lines change all the time, but the major lines change too. That's why a good palmist will take a print of your hand to detect the lines which are likely to develop or are even fading out. Many people want to know what the future holds for their married life. Do it yourself palm reading can be fun. If you're seriously interested in what your palm says about marriage and what the future holds, it's best to consult a professional palmist. If one professional gives you a prediction you don't like, get a second opinion. If that palm reader differs too much, get a third opinion. If two agree, you have an answer. Palm reading is very sophisticated art, and artists often see things differently.